Despite the onslaught of digital advancements, field teams are often left in the digital dust, burdened by archaic, manual tools that obstruct productivity. These outdated tools not only result in costly delays and mistakes, but also create a rift between field and back-office teams, who must still collaborate despite the drastic differences in their resources. Fortunately, digitizing your forms collection eliminates the need for manual data collection and processing, leading to faster form completion, increased business agility and improved operational insights. 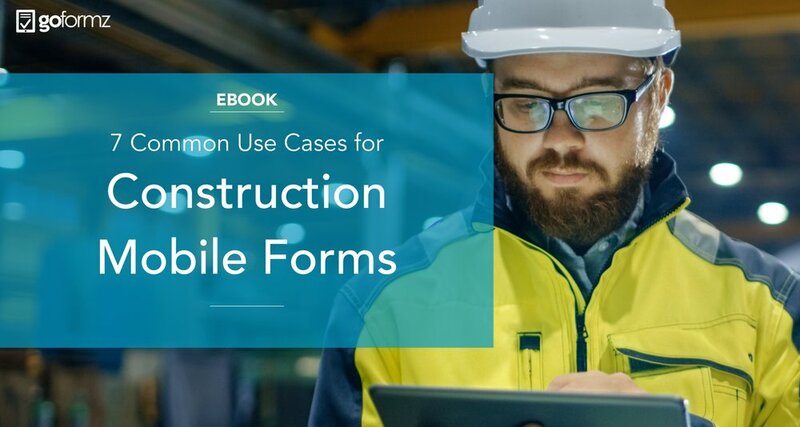 Mobile forms are an important first step in modernizing your operation and directly benefits your bottomline. In this use case from Farrans Construction, onsite teams leverage Automated Workflows to deliver completed forms for authorization, review and implementation – resulting in incredible time and budget savings. Manual math and form delivery wastes time and results in costly errors. In this use case from Oscar W. Larson, Automatic Calculations enable audits to now end with a digitally signed contract, rather than a trip back to the office to perform calculations and secure approvals. This instantaneous feature has produced more efficient, effective sales and audits due to more accurate bidding, leading to $10M in sales. Capturing job site images can be incredibly difficult when dealing with inclement weather or unorthodox work sites, like cranes. In this use case from DESHAZO, mobile forms are used to collect crane inspection Images at extreme heights, and even include annotations. DESHAZO not only needed to capture contextual data types, but also standardize their documentation across each of their locations, during their rapid operational growth. With mobile forms, DESHAZO personnel can now instantly generate a form using the same template across each of their locations. This is incredibly useful when working with government agencies. Paper forms are easily damaged in the field, result in human error and demand manual delivery and processing. 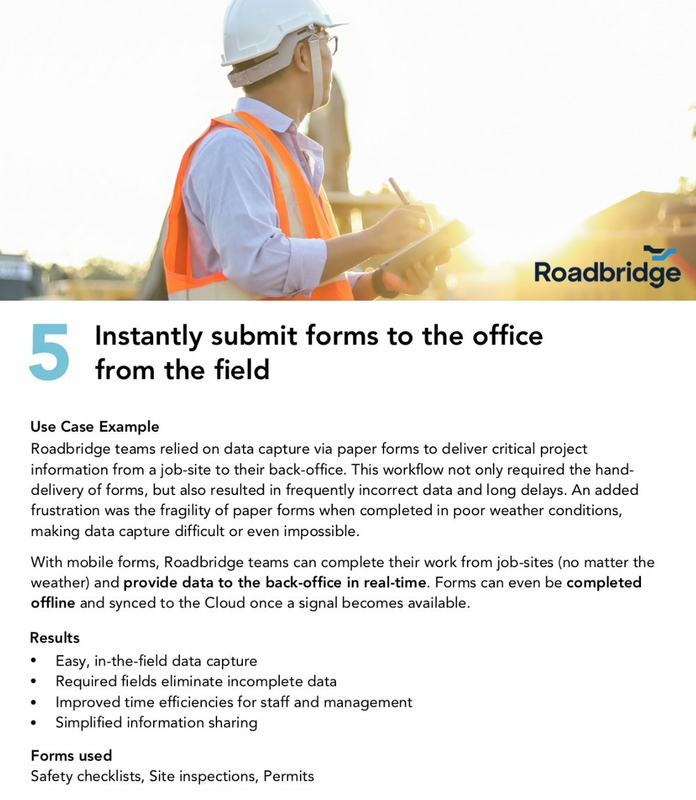 In this use case, Roadbridge teams sidestep the inefficiencies of paper forms, leveraging their digitized forms to provide highly accurate data to the back-office in real-time. Manual processing of forms and attachments result in missing data and detrimental delays. In this use case from Inspecta, mobile forms used in tandem with an integration with ServiceMax results in instantaneous field data access a 15% increase in field efficiencies. Processing data collected via paper forms obstructs your workflow. In this use case from Oldcastle, mobile quality control forms are used to collect, process and report on factory floor data, in real-time. With more timely, precise insights, Oldcastle achieved a savings of $500K in production costs after identifying factory floor inefficiencies. Ready to improve your construction data collection, processing and analysis? Download our ‘7 Common Use Cases’ eBook to learn more.